1. FACE. This area will work well on how your facial expressions be look like. As a singer you have all the control of what you are trying to express. It must be in pleasant way. Under in face category let’s break it into pieces, there you have the JAW, LIPS, TEETH, TONGUE, CHEEKS, EYEBROW, EYES. How to warm-up these parts? Drop your Jaw while your mouth is closed. Hold it for 10-20 seconds or more. Stretch out your Lips a lot more. To perform the stretching to its fullests, just anunciate the vowel sounds aeiou in silent mode. In every vowel, stretch your lips for 10seconds or more. For the Teeth, pronounce the consonant sounds like SH, TS, TH, S. This will help to correct especially if you have mis aligned teeth and this will treat the problem, practice more often because it needs to register automatically. Stretch your Tongue out, then flatten it and it has to be slowly back in. Circulate your tongue around with your upper and lower teeth back and forth. Massage your Cheeks or possible the entire face. Raise your Eyebrows hold it for 10 seconds or more. While eyebrows is raising, open your Eyes wider. 2. NECK. Rotate it slowly to your right then to your left. 3. SHOULDER. Rotation will do. 4. HANDS. Shake it for 20 seconds this will lessen the tension. 5. CHEST. Have you tried to expand and lift up your chest? How did you make it? It is all about air breathing. This level you are going to perform the breathing exercises. How breathing exercises work out? Breathe through your nose 2- 3 seconds, please hold. Did you ever feel the movement of your chest? It is expanding and lifting. While you hold your breath, now exhale through your mouth slowly. And this is how you warm up your chest. Are you curious of the word Lungs? Just practice this breathing exercises the lungs will gain its benefits. Because, just imagine the inside of your chest, there you can see your lungs. 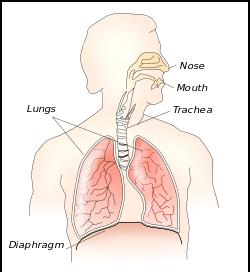 As you exhale your diaphragm is working out. Put a pressure to tighten your stomach as you exhale. This is how to exercise your diaghragm. 6. LEGS, KNEES TO FEET. Put pressure on these parts, just let your body weight fall down to the floor. Don’t carry the burden of your weight just until your hips or your waist. Let your legs, knees to feet will work out for you. This will make you relax more. Stand still and imagine that you are a CEO of a huge company and is ready to deliver the powerful speech that will make history. Your confidence level will lift up if you are relax and then you can deliver your best performance. Please Leave comments if you have more questions. Thanks!